My name is Fozia Zulfiqar. I am the first woman CSP (37th CTP -PA & AS) officer of the Gilgit region. Originally hailing from the beautiful valley of Hunza, i was born and raised in Gilgit city. I am presently serving in office of the Auditor General of Gilgit-Baltistan. Previously, I have served in Customs Collectorate- GB (Chief Accounts Officer (CAO) & Assistant Collector (AC-HQs), Employees’ Old Age Benefits Institute (Assistant Director) and in O/o the DG Audit, Federal Govt. Islamabad (Assistant Director). After been nominated by the Auditor General of Pakistan for a Certification program in eLearning recently, I am the only officer of the office of Auditor General of Pakistan, who has been certified as the eLearning Specialist by a body of the global professional organization for Supreme Audit Institutions, the INTOSAI Development Initiative (IDI). The purpose of sharing my success story in CSS is to give an impetus to the youth of my region who aspire to join Civil Service. Thus, with an optimistic approach and anticipating that my success story would serve as a source of inspiration for all the youngsters from GB who want to pursue their career in Civil Service, I am hereby narrating my journey. I got my early education from a government high school in my native town, Gilgit. I had been a very good student throughout my academic career, remained the top scorer of my batch many a times in the Board exams. I passed Matric Board exams with flying colours and succeeded in securing a top score in govt. schools of the town. Then I did my FSc. and BSc. from Public College, Gilgit and remained the top scorer of my college batch in BSc. Board exams. After securing highest marks in BSc, I so easily got admission in Qauid-e-Azam University for MSc. I had always aspired to study in QAU so getting admission in university was truly a dream come true for me. Doing masters from QAU was not my ultimate goal as my ambition to join civil service was always there in my mind right from the school days. It was my elder brother whom I had got inspiration from and had decided to follow his suit to be a part of the Civil Service. I was in school when he had passed his very first CSS attempt; his achievement was being highly acclaimed by everyone in family. Thus, watching my parents, family members and relatives taking pride on his success really imbibed a yearning inside me to set the same goal for my own self. After completing my MSc. with a very good percentage, I wanted to take a break before gearing up for CSS exams. But immediately thereafter, I came to know about the competitive exams for Gilgit-Baltistan which were to be held shortly within a month or two. On advice of my family, I decided to give an attempt despite of the fact that I had got absolutely no time for preparation and even for optional subject selection. So, I just went with the subjects which I had studied in BSc. and took the attempt. I cleared the written part, secured a very good score in interview but couldn’t get seat allocation. Failing to get seat allocation was a serious list, a name similar to my own caught up my attention. After checking it twice or thrice with the roll number, I found out that the name was none other than mine. 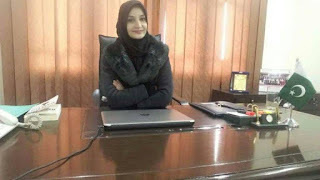 I had cleared the exam and had become the first woman CSS officer of Gilgit-Baltistan. With the tears welled up in eyes and a precious grin on his face, seeing my late father highly elated and extremely proud while reading news on my achievement in news papers gave me a feeling of great contentment. That was an elusive state of happiness that made me feel that I have made my parents, family and friends proud. The thinking gave me an immense pleasure that my success has not only made my family proud but has also paved the way for the female CSS aspirants of my region. My belief was strengthened that day and I would say it quite convincingly even now that youth of my region possesses sufficient potential and aptitude to be a part of the most prestigious service of Pakistan; they are equally endowed with passion, with which they can serve their country and its people in a befitting manner. All they need is a sturdy will-power; an unswerving fidelity and a selfless devotion which I believe, are the elements, absolutely indispensable to prove oneself fully capable of serving in the highly venerated service of Pakistan.